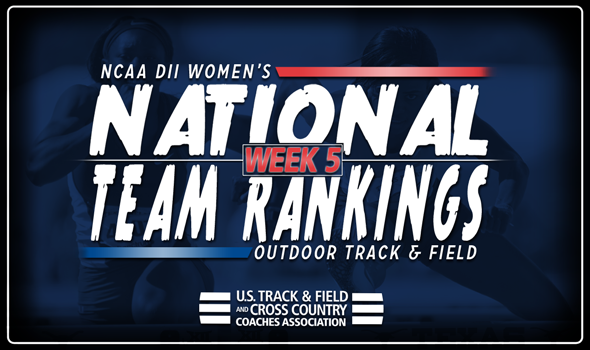 NEW ORLEANS – Much like last week, the NCAA Division II Women’s National Team Rankings have undergone a virtually complete overhaul, as all but one team in the top-25 remained in place from a week ago. A week after relinquishing the top spot, West Texas A&M reclaimed first after a strong weekend at the NMJC Ross Black Open. The Lady Buffs posted five top-10 NCAA Division II Descending Order List marks on the week, including a huge mark from Fatim Affessi in the triple jump. The sophomore recorded the fifth-best wind-aided mark in NCAA Division II outdoor collegiate history with a leap of 13.23m (43-5), good for an Automatic Qualifying Mark. West Texas A&M wasn’t the only squad that made some noise in the top-five this week. Grand Valley State also moved up two spots to second for its highest ranking since the 2016 campaign. The Lakers split its squad between the Bison Outdoor Classic and Ball State Challenge where it got four top-10 NCAA Division II Descending Order List marks, including the third-best 4×100 relay time of 46.14. San Francisco State reappeared in the top-five in fifth after its outing at the Woody Wilson Classic. The Gators’ 4×100 relay team ran a 46.44 at the meet, putting them in fifth place on the NCAA Division II Descending Order List this season. Falling, but remaining in the top-five, was Angelo State and Pittsburg State. Both squads dropped two spots, coming in at third and fourth, respectively. Lincoln (Mo.) had arguably the biggest jump of any team on the week, moving up 41 spots to seventh. The Blue Tigers dominated the Illinois State Redbird Invitational, recording five top-10 NCAA Division II Descending Order List marks. Renea Ambersley ran the fastest 400 time in NCAA Division II this year at 53.70, while a quartet of runners posted the nation’s fastest 4×100 relay time this year at 45.80. The seventh-place ranking marks the Blue Tigers’ best ranking since coming in at first during the final week of the 2016 season. Saint Augustine’s also made positive movement inside of the top-10, moving up five spots to eighth. The Falcons saw Shannon Kalawan run a 23.83 in the 200 at the NCAT Aggie Invitational to vault herself to the top of the NCAA Division II Descending Order List. Rounding out the top-10 on the week was Alaska Anchorage (sixth), Texas A&M-Commerce (ninth) and Azusa Pacific (10th). All three programs fell in the rankings from a week ago. The lone team to stay in place from last week to now was Cal State LA, who remained in 17th in the rankings. The NCAA Division II Outdoor Track & Field Championships will be held in Charlotte, North Carolina, on May 24-26.